Sign up at the Colma Community Center for the 8th annual Town Wide Garage Sale. 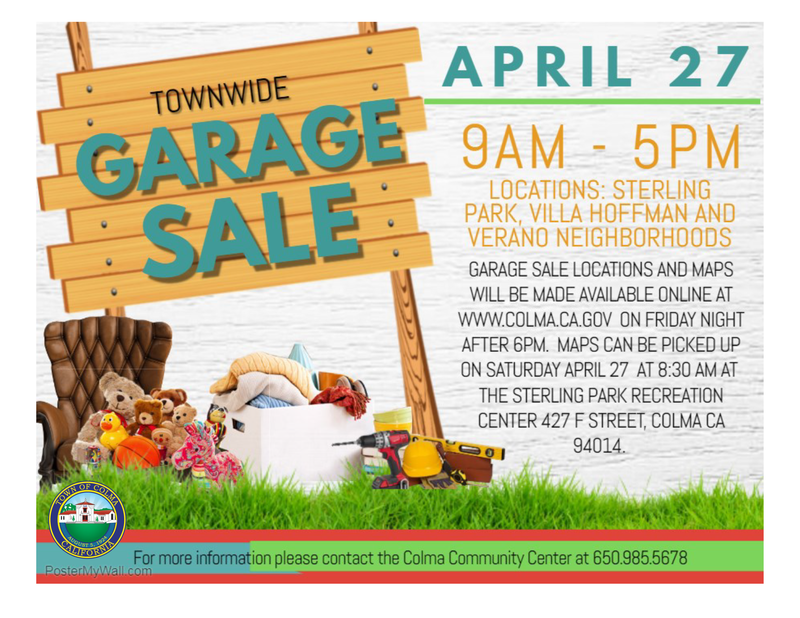 Each Colma resident who signs up for the Town Wide Garage Sale will host their own sale at their address. Once the Recreation Services Department has received all the names and addresses of the participants, we will advertise our Town-Wide Garage Sale through various media outlets to all potential shoppers. At the time of sign-up, the Recreation Services Department will ask you for a list of each big-ticket item, such as a refrigerator, couch, television, etc. Prior to the day of the event we will provide a list of participant addresses and their big ticket items to potential shoppers. There is no cost to this event; we just ask that everyone who intends on having a garage sale signs up at the Colma Community Center. In order to allow more parking for shoppers we ask that participants park their car(s) along Clark Street, F Street, Hillside Blvd, and El Camino Real on the day of the event. For more information please contact us at (650) 985-5678.